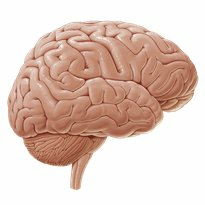 The Cerebrum is the largest part of the brain and consists of the cerebral cortex which is responsible for motor, sensory and cognitive functions. More. 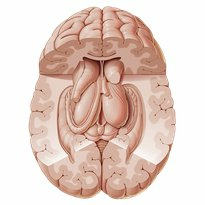 Below the cortex there are important structures (limbic system, diencephalon and ventricles) that play an important role in both motor and cognitive functions. More. 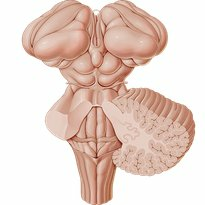 The Cerebellum is responsible for the co-ordination of movements. 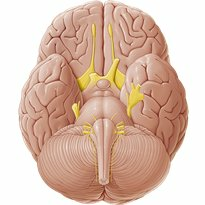 The Brainstem consists of medulla oblongata, pons, and midbrain. More. 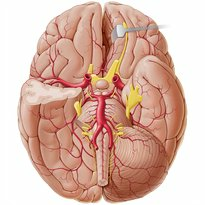 In this chapter we explore the layers that cover the CNS (meninges), the vessels and the ventricles of the brain. More. 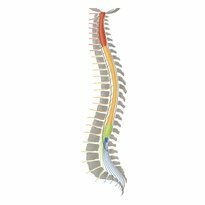 The spinal cord and the brain, together, make up the central nervous system (CNS). 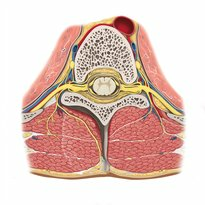 This chapter will discuss all the anatomy related to the spinal cord. More. Main motor and sensory tracts of the Central Nervous System. The twelve cranial nerves emerge from the brain and the brainstem. 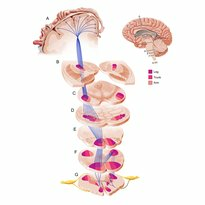 Via the cranial nerves, information is exchanged between the brain and areas of the body. More. The peripheral nervous system (PNS) consists of nerve fibers and cell bodies outside the CNS that conduct impulses to or away from the CNS.